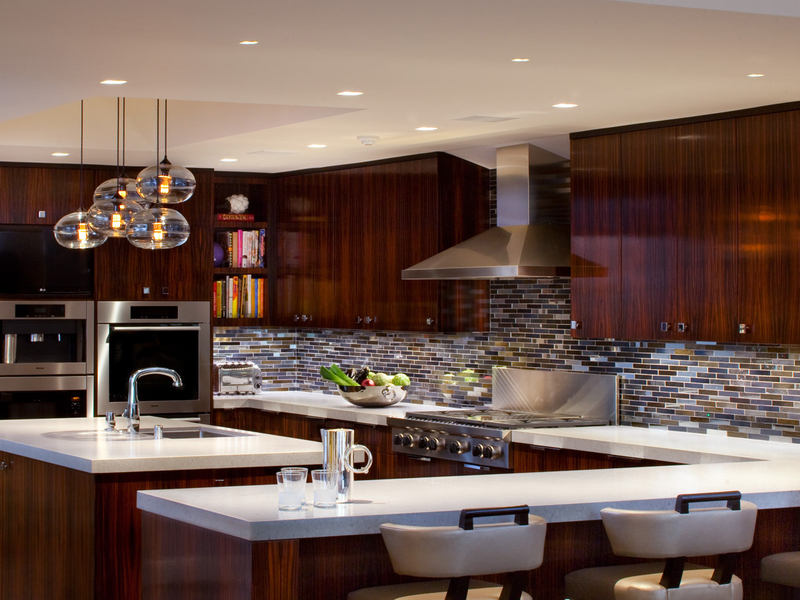 For the first time, we recently incorporated high-tech, energy-saving LED lighting into an entire kitchen project. There are no incandescent, halogen or fluorescent bulbs to be found – not even in the dramatic drum pendants we specified for the island. 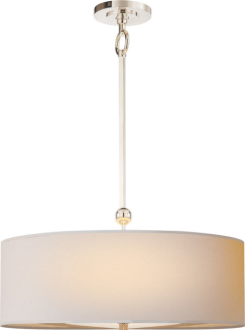 Fabric drum pendant in polished nickel ~ stunning! The results are beautiful, the clients love it (photos coming soon!) and in the process we became LED converts. 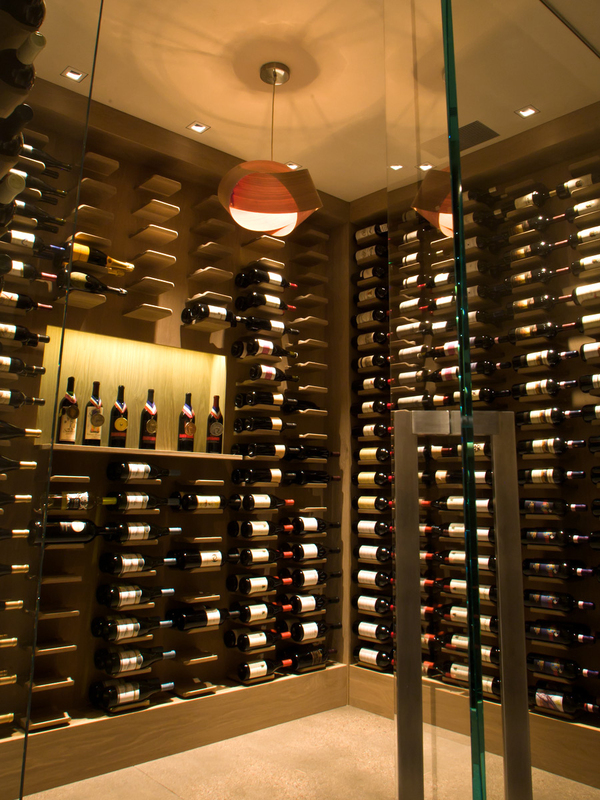 We give full credit to Lucía Lighting and Design in Lynn for helping us through the process. So we asked Lucía owner Lucy Dearborn to talk to us more about how to choose the right LED lighting. After giving us an overview of LED, Lucy focused on recessed fixtures. A Color Rendering Index (CRI) of 80 to 100. The CRI measures the ability of the light source to reproduce the colors you might see if an object were placed in daylight. Typical incandescent bulbs have a CRI of 100, or the maximum. The higher the CRI, the happier you are likely to be with your light. There is a high initial cost … but dramatic cost savings over time: A top quality LED replacement bulb (with lensing that diffuses the “Lite-Brite effect” of the LED light cluster within) can cost $75 for one fixture at 2700K and 80-plus CRI. That seems like a lot, but with 75-90 percent energy savings and a lifespan of 50,000-plus hours, the investment does pay off. The new LED recessed fixtures that we specified for our recent kitchen project were about $135 apiece. That’s about double the standard cost for all-new recessed incandescent lighting, but in the scope of a major project, it was an easy call. LEDs are dimmable with the proper dimmer. We used CFL-LED dimmers from Lutron, which also work with fluorescent lights. They were slightly more expensive than standard dimmers, but the cost was not significant. There are no incandescent, halogen or fluorescent bulbs to be found – not even in the dramatic Visual Comfort drum pendants we specified for the island. LEDs don’t dim exactly like an incandescent light … but the technology is coming. In her Lucía showroom, Lucy Dearborn demonstrated that dimmed LEDs can’t quite mimic the orangey tones produced when you dim an incandescent light. But such products are in development, she said, so consider waiting a bit if that is really important to you.